Exchange messages with the game's characters. 5pb. 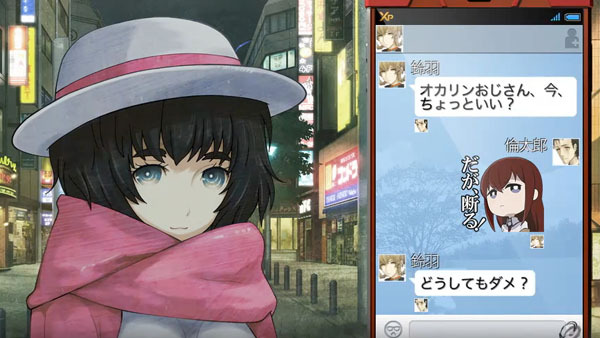 has released a new Steins;Gate 0 video introducing the game’s “RINE Trigger” system. Protagonist Rintarou Okabe has upgraded from his feature phone to a smartphone. Different from sending e-mails, you can now exchange messages via the RINE app in real-time. Your friends’ reactions will change based on your responses. When a new message arrives, you’ll get an indication in the upper left corner of the screen. You’ll be able to enjoy both the main story, as well as ordinary conversations with the game’s characters. And the ability to use lots of stickers, of course.